Not sure how this depicts Justice? Click here. Etteilla: Equity, Probity, Honesty, Jurist, Human Rights. Lévi: This Hieroglyph depicts Justice with sword and balance. 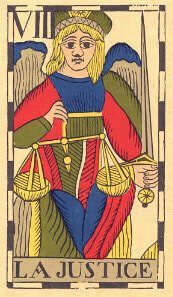 Illustration (left): Justice from Le Tarot Flamand by F. I. Vandenborre (c. 1780) (re-published by Carta Mundi). Click the image for a larger one. Christian: Justice, which proceeds from God, is the stabilising reaction which restores order, equilibrium between right and wrong. Papus: The ideas expressed by this symbol are of Equilibrium in all its forms. Felkin: Her emblems are the Sword and Scales. 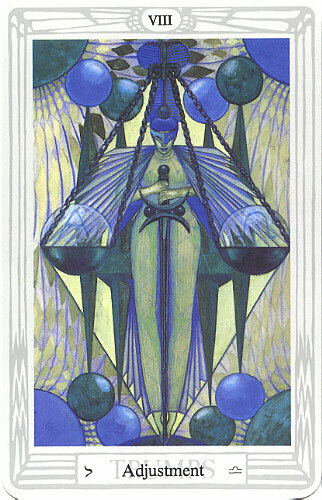 Waite: This card follows the traditional symbolism and carries above all its obvious meanings. Wirth: Every action, every thought, every desire has an effect upon Justices beam; as a result there are accumulations which will have their fatal repercussion for good or for ill. The energies at work are stored; those which proceed from a generous kindness enrich the soul, for he who loves makes himself worthy of being loved. Case: Psychologically, the picture of Justice illustrates the law of poise and self-direction. A balanced personality is faithful, constant and confident, because right use of reason has established enduring certainty as to the just outcome of all activities. Crowley [who replaced Justice with Adjustment]: Justice has none but a purely human and therefore relative sense; so it is not to be considered as one of the facts of Nature. Nature is not just, according to any theological or ethical idea; but Nature is exact. 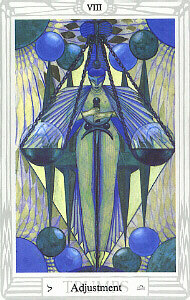 This card depicts the goddess Maat; in Eastern philosophy she is Karma. Illustration (left): Adjustment from The Thoth Tarot Deck designed by Aleister Crowley and painted by Lady Frieda Harris (copyright &COPY; 1944 Ordo Templi Orientis). Click the image for a larger one. Gray: A balanced personality. Legal aspects of money matters with good outcome. The elimination of useless, outworn forms of education. A mixture of the right ingredients, as in science, chemistry or cooking. May mean education, with a well-balanced mind as its aim. Sadhu: If someone, because of acting in a way contrary to the Laws of Balance, has spoiled his karma, that record of his personality in the chain of incarnations, he must remove this stain at the time of a fresh encounter with the page he has spoiled. I think this simile is sufficiently illuminating in order to realize the mechanism of karma. ONeill: The presence of virtues, e.g., Justice, in the deck shows that the Renaissance designer was not rejecting the wisdom of the Church, the wisdom of the Scholastics, rather he was trying to synthesize it with wisdom of the ancients. Justice is first and foremost a symbol of balance and, mythologically, the figure of Justice is probably derived from the goddess Themis. 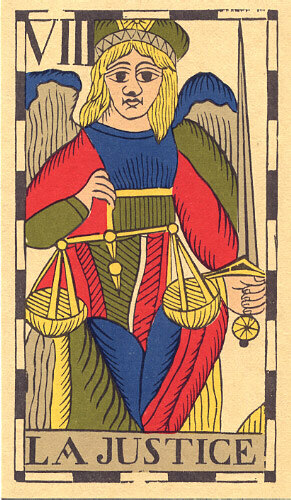 Pollack: The scales of justice also represent the perfect balance of past and future. Like Buddha remembering all his lives, we can only get loose from the past by becoming conscious of it. Otherwise we constantly repeat past behaviour. This is why Justice belongs in the centre of our lives. Turk: This card is involved with balancing the rational mind. Being the highest possible state of evolution and the key of occult science, this balance is achieved by the art of philosophythe love of Sophia, or wisdomwhich is incomplete unless accompanied by the combining of science and religion. Symbol (top): It depicts a balance, which often comprises, in part, this Arcanum.